During my last SoWa of last summer, I had a group of friends come by who I don't see on a regular basis. It's always great to have people come by your booth that you know, and even better when they see something they like! 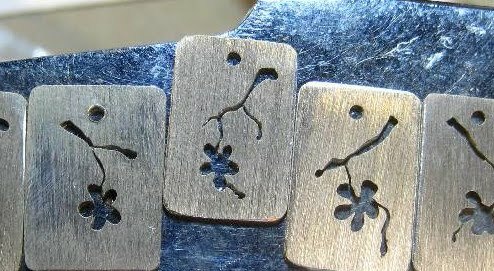 My friend Anita really liked my single cherry blossom pendant and asked me if I could make a ring like it. I said "Absolutely!" Of course I don't have a picture of a finished one, but these are a few in production. She had a request to make it personal to her. She wanted her daughter's name on the band in the back of the ring. Here is what I made for her. 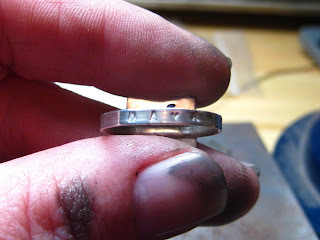 These last pictures are after I had Cristina Hurley help me to oxidize the ring to make the insides black. I have Liver of Sulfer to oxidize, but as you can see from the work I normally do, I never use it. I need to start using it because the results can be dramatic. Really lovely, Nancy! I love that it is personalized, too. The oxidization really accentuates the design. It came out beautifully! I love that you engraved her daughter's name on the band! I can attest as to how good it came out! :) you should make more into rings for your collection! I agree with Cristina - more rings!!! Wow, totally gorgy. I love the soft edges too, very femme!! Oh and I agree about the engraving. Do it up!! Engraving is awesome!! !